In this interview with James Gulley, we explore the results of the Phase I trial for M7824. The results provided preliminary evidence that combining the anti-PD-L1 mechanism with a transforming growth factor-β (TGF-β) trap in one molecule may generate anti-tumor activity in a heavily pre-treated patient population who have previously failed therapy with anti-PD-L1/PD-1 checkpoint inhibitors. Patients with anti-PD-L1/PD-1 refractory or resistant advanced NSCLC have severely limited treatment options available to them and the preliminary results of this trial are a promising first step towards identifying treatment modalities that could potentially benefit these patients with significant unmet needs. Could you tell us about the current status of anti–PD-1/PD-L1 therapy for NSCLC? Nivolumab and pembrolizumab are approved for NSCLC; nivolumab for second line and pembrolizumab for first line, if PDL1 expression is seen in at least 50% of the tumor cells. Pembrolizumab is also used with docetaxel in first line regardless of PDL1 staining. There is also very interesting data with durvalumab suggesting substantial improvement in progression-free survival (PFS) (hazard ratio approximately 0.5) in patients with stage III lung cancer treated with durvalumab vs. placebo. However, there remains a great need for therapies in patients who progress following PD1/PDL1 targeted agents. Would you like to find out more about pembrolizumab for NSCLC? Check out this peer-reviewed Drug Evaluation from Immunotherapy. How could M7824 overcome some of the challenges associated with treatment failure to anti–PD-1/PD-L1 agents? TGF-beta is a pleotropic cytokine that has many negative regulatory functions in patients with cancer. It is involved in immune suppression, angiogenesis, tumor metastasis (EMT) and resistance to chemotherapy. PDL1 also appears to remain an important checkpoint in patients who fail PD1/PDL1 blockade, it is just not sufficient. We reasoned that the combination of TGF-beta inhibition through sequestering (vacuuming up) TGF-beta and blocking PDL1 will be helpful to overcome primary-refractory disease and acquired resistance (initial response followed by progressive disease). Could you tell us about the main findings obtained from the Phase I trial for M7824? The Phase I study was divided into two main parts. The initial dose escalation phase used to determine what dose of this agent, which was being given to humans for the first time was safe and what the physical properties of M7824 were at the different dose levels (looking at amount in blood, amount of inhibition of PDL1 and amount of inhibition of TGF-beta). 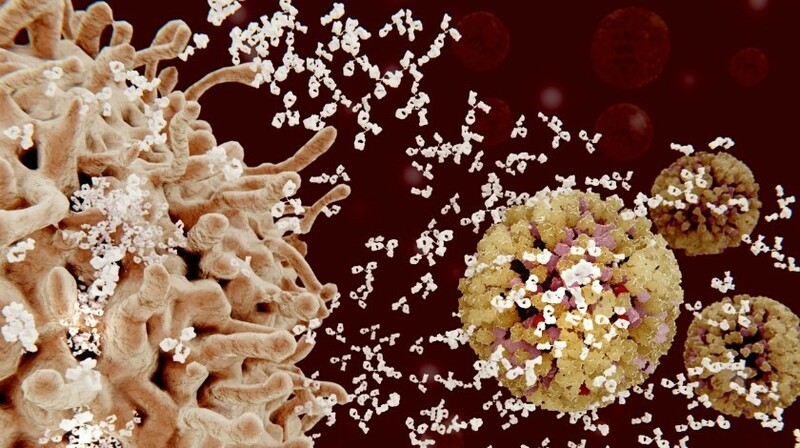 Four dose levels were tested (given IV every 2 weeks) and at all dose levels above 1 mg/kg (the first dose level), there was good activity of the agent in terms of saturating the PDL1 on circulating immune cells and sequestering all active TGF-beta throughout the dosing period. In addition, of the initial 19 patients tested, there was one complete response (tumor completely disappeared) and several partial responses, all of them long lived. The second portion of the study was taking one dose level (a flat dose of 1200 mg IV every 2 weeks) and testing this in multiple distinct groups of patients. The one group of patients highlighted at SITC 2017 (held November 8–12 2017; MA, USA) was the 83 patients with lung cancer who progressed on PD1 or PDL1 agents. The primary endpoint in this group was to look at the clinical activity of this agent. Approximately 75% of the patients had three or more prior therapies for lung cancer. This amount of prior therapy is often associated with limited responses. Approximately 5% of the patients had a partial response and approximately 25% of the patients had stable disease or some shrinkage of disease (including those with the partial response). Interestingly, there appeared to be a concentration of responses in patients who had no PDL1 staining in the tumor (suggesting that the TGF-beta inhibition may be playing a role in causing those responses). This sets this dataset apart from those of other PD1/PDL1 agents that have responses enriched in PDL1 positive patients. In the expansion cohort, 75% had three or more prior therapies making them further advanced, with more resistant disease. Approximately two-thirds of them had PDL1 staining of at least 1% in this very sensitive assay, which is about 20% less than the ~85% seen with the second-line lung cancer trial of avelumab tested with the same assay. This suggests less of an underlying activated immune response, perhaps due to multiple prior therapies. Almost half of the patients had disease progression as the best response to prior PD1 or PDL1 therapy suggesting that these were not only very refractory, but they also had aggressive, rapidly growing disease. That adds further to the impact that disease stabilization suggests in this group of patients seen in this study. (If one has a slow growing tumor, then stable disease may not indicate activity of the agent. However, those with primary refractory disease progressed quickly on their prior PD1/PDL1 targeted therapy). Do you see potential for M7824 in cancers beyond 3L NSCLC and treatment refractory/resistant populations? Absolutely. I think this could be used widely in a variety of different cancers either as a single agent (in both typically PD1/PDL1 responsive cancers and refractory cancers) or in combination with other immunomodulatory agents. We are planning several studies of vaccine in combination with M7824 to initiate an active, tumor-targeted immune response. Furthermore, we are planning a Phase II study in patients with HPV positive cancers where we have seen multiple responses in the Phase I study. What role do you see for bifunctionals versus other potential advances in immuno-oncology? What is different about M7824 vs. other bifunctional therapies? Bifunctional agents include the bispecific antibodies that bind T-cells and tumor cells. These are very interesting agents that can help T-cells come into contact with and stay in contact longer with tumor cells to aid in recognition / elimination. The M7824 agent is different in that it really is priming the tumor microenvironment to enable T-cells to remain active (by blocking both PDL1 and TGF-beta). This could have broad use across many tumor types regardless of target antigen and could be a great combination partner for immuno-oncology strategies. Can you tell us about some of the emerging concepts in immuno-oncology? While there have been amazing rapid, deep and durable responses seen with PD1 and PDL1 inhibition, this is only seen in a minority of patients for most tumors. Part of this is that in some tumors, there is no underlying immune response (e.g., most breast, colon and prostate tumors). In some other patients there may be other regulatory pathways (TGF-beta, IDO etc.). Combination approaches designed to initiate an immune response (e.g., a therapeutic vaccine) may expand the proportion of patients responding to immune checkpoint inhibitors and make for a great rational approach to combination therapy. There are ongoing studies looking at this approach including studies at the NCI and planned studies at the NCI that will be utilizing M7824. I think that this type of approach (initiating an immune response then facilitating the effector function of the immune cells within the tumor) hold the most promise and preliminary data from these combination studies appear promising. Modern anti-cancer immunotherapy has fundamentally changed how we approach and treat many patients with advanced cancer. Studies have demonstrated that it is better tolerated and more active than chemotherapy in many cases. However, a minority of patients currently benefit from such approaches. It is important for us to continue to learn about the impact of the immunotherapy on the tumor microenvironment so that we can design rational studies that will increase the proportion of patients seeing dramatic clinical benefit. We also need to do better about increasing the proportion of patients going onto clinical trials, which for adults with cancer is <5%. With the promise of long-term disease control, limited side effects and the patient friendly thought that their own immune system will help them fight the cancer, I expect immunotherapy studies to be even more sought after in the future. Would like to find out more about immunotherapy? Dr. James Gulley, MD, PhD, is Chief, Genitourinary Malignancies Branch; Head of Immunotherapy Section; Director, Medical Oncology Service, National Cancer Institute (NCI). Dr. James Gulley is an internationally recognized expert in cancer immunotherapy with a strong interest in prostate cancer. Since 1998 he has authored and run a variety of clinical trials at the NCI. These innovative investigator initiated studies involve the use of cancer vaccines and other immunostimulatory agents, and the combination of immunotherapy with other treatment strategies. In particular, he has played a central role in the clinical development of a prostate cancer vaccine (Prostvac), created in the NCI, and serves as the principal investigator on an international Phase III randomized clinical trial of this vaccine. He is also the coordinating principal investigator of an international trial of an anti-PDL1 antibody (avelumab) and another international study of anti-PDL1 / TGF-beta Trap (M7824). Areas of Expertise are immunotherapy, therapeutic cancer vaccines, immune checkpoint inhibitors, prostate cancer, clinical trials, combining immunotherapy with other therapies. The opinions expressed in this interview are those of the interviewee and do not necessarily reflect the views of Oncology Central or Future Science Group.